“The KidsCareEverywhere software will absolutely help us. It will be a huge benefit. You saw the enthusiasm of our doctors here. They were in love with it,” observed Dr. George Whitelaw, president of Childrens Well Being Foundation (CWBF) in Costa Rica, where KidsCareEverywhere (KCE), a San Francisco charity founded by Dr. Ron Dieckmann, ‘73 had just completed a physician software donation and training. The two global health groups had been linked through Jonathan Sprague of ClassACT earlier this spring, as part of a collaborative attempt to bring together Harvard-affiliated nonprofit organizations working in health care. 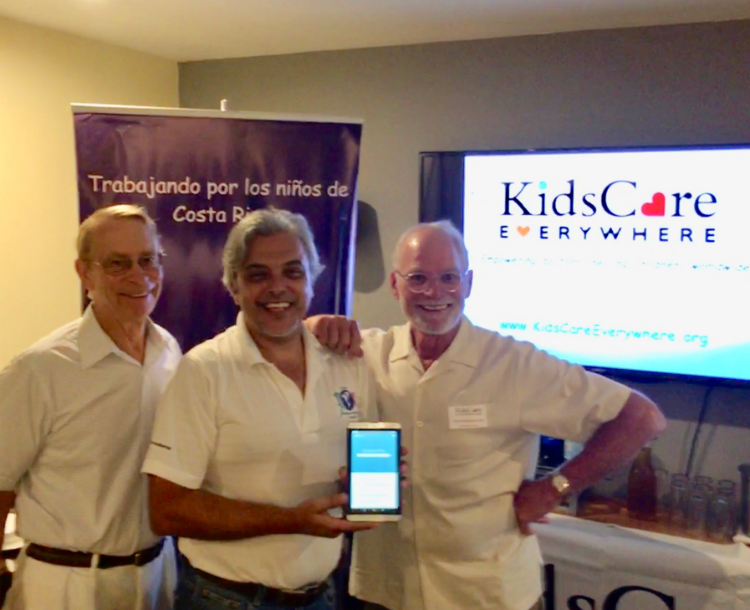 Dr. George Whitelaw, president of CWBF; Jean Carlo Brenese, CEO of Children’s Well-Being Foundation, Costa Rica; and Dr. Ron Dieckmann, Executive Director of KidsCareEverywhere in San Jose, Costa Rica. Ron donated a tablet PC to help improve clinic access to the medical software he gifted to CWBF on his July, 2018 visit to Costa Rica. George, an orthopedic surgeon and husband of Dr. Phyllis Carr, ’73 began CWBF over ten years ago. The organization is based in San Jose, Costa Rica and serves poor children—mainly Nicaraguan immigrants. They offer free medical, psychological, eye exams, and dental care to children and adolescents from communities with limited access to health services. CWBF is currently under enormous strain from a flotilla of refugees from their northern neighbor Nicaragua, who are fleeing from violence in their own country and entering Costa Rica, whose lean health care system is already unable to care for their own Costa Rican children. Ron, A pediatric emergency physician, professor emeritus at UCSF and medical software developer, founded KCE in 2006. The organization donates state-of-art medical software to doctors working in low-income countries and serving impoverished children. KCE has sites in 25 different countries on three continents—Asia, Africa, and South America. The software is gifted to KCE by EBSCO Health Care in Ipswich, and Ron has been intensely involved with development of the pediatric components. Ron says the software is a transformational experience for the doctors and changes practice almost instantly by providing an encyclopedia of current, evidence-based medical knowledge though a mobile app. The app does not require web access and is available at the bedside—so it works very well for doctors in the low-income world. “We really enjoyed working with George and his group at CWBF”, commented Ron. “His organization is doing totally fantastic work. We want to support his doctors who are dedicated but overwhelmed with patients and have almost no resources or information sources”. The software will allow doctors to access medical information in seconds, and will help identify sick kids that need life-saving drugs or referral into the public Costa Rican system. The two groups want to continue working together. Ron and George will be looking for each other at the 45th reunion this fall to plan their next collaboration! This year’s lecture, on Thursday, October 11th, at the very beginning of Class of 1973's Reunion, will be delivered by Ofeibea Quist-Arcton, National Public Radio’s distinguished journalist reporting on Africa. Quist-Arcton was appointed the BBC West Africa correspondent in 1990, heading the regional bureau and covering 24 countries. 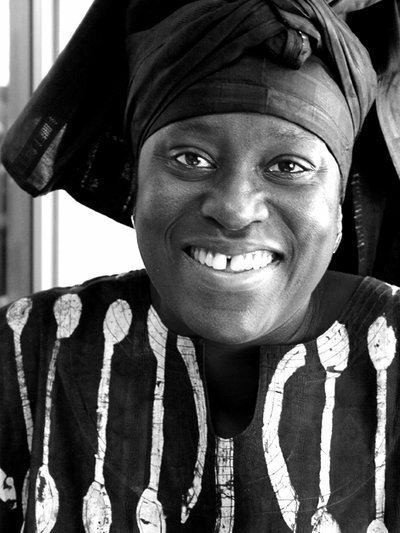 In 1994 she returned to the BBC in London, where she served as a host and senior producer on the BBC World Service flagship programs, Newshour and Newsday, as well as a contributing Africa specialist for other BBC programming. Beginning in 1995 Quist-Arcton began work in the United States of America for the joint BBC-PRI production, The World. Quist-Arcton joined National Public Radio in 2004 at the newly created post of West Africa Correspondent in Dakar, Senegal. She reports on all aspects of life and developments on the African continent. Quist-Arcton was awarded the 2015 Edward R. Murrow prize for her reporting on the 2014 Ebola epidemic and Boko Haram, which she shared with photojournalist David Gilkey. The Mehta Lecture was established by John and Kitty Galbraith in honor of their friend, an influential Indian woman scholar, and the lecture was delivered shortly after its founding by Benazir Bhutto. Donations to the Radcliffe Institute in support of the Lecture qualified as gifts to the University in our 45th Reunion year and demonstrate a commitment to the BBLP through ClassACT. Natasha Jehangir Khan and Roohi Abdullah have just matriculated at the Kennedy School’s Mason Program, under the auspices of BBLP. We are delighted with the outcome of our efforts: both are Pakistani women with substantive experience. 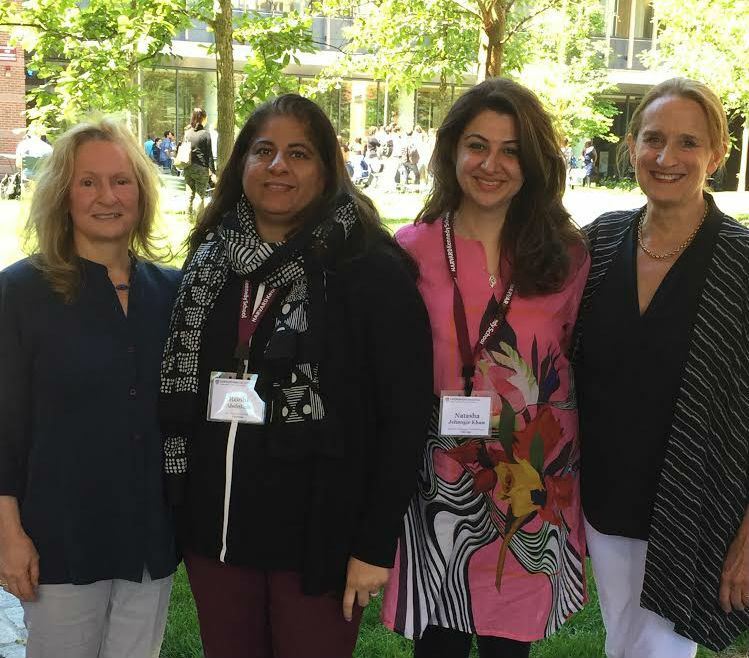 After years of policy making, for Natasha in Pakistani government and for Roohi, in many countries for the World Bank, they can use the year in Cambridge at the Mason Program to prepare for return to Pakistan to transition into formal roles of authority. Holly Weeks, Roohi Abdullah, Natasha Jehangir Khan, and Marion Dry. Natasha Jehangir Khan has 15 years of experience in constitutional, administrative and regulatory work. Having received an LLM at University College London in 2001, she began her career in the office of the Attorney General of Pakistan, and later went on to join the Securities and Exchange Commission, the regulator of the corporate and financial sector of the country except banking, where she eventually served as the Head of Legislation and General Counsel Department. A licensed Advocate of the High Courts of Pakistan, she has worked creating performance manuals, structures and systems to contribute strength to the institutions employing her, a necessity in a developing country where power so often resides in individuals instead of institutions. Natasha has worked as a consultant with several Asian-based development organizations advising the Government of Pakistan on regulatory reforms and enhancement of the investment climate in the country, and was instrumental in developing legislation for transitioning Pakistan’s electricity sector from a single buyer to a competitive market structure. Natasha plans to use the year at the Mason Program to acquire the connections and skills to facilitate her transition to a role of authority. Co-Chairs Jonathan Sprague and Marion Dry traveled to Chicago for the first ever ClassACT Midwest regional weekend, April 21-22. The weekend's work agenda was to introduce ClassACT and the ways classmates and their spouses/partners can engage for work and fun. 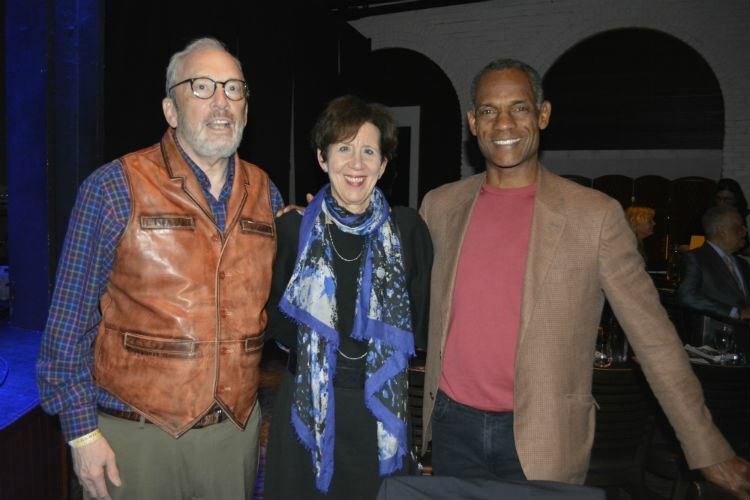 The weekend was the brainchild of Chicagoans, Gina and Roger Myerson, who have been keen advocates for ClassACT. 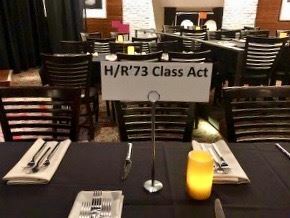 With invitations going out to classmates from four states, we wanted to make sure that we had a weekend of fun, so Andrea Kirsh, Craig Coit, Gina Myerson, Rick Weil and Marion Dry all worked to put it together. Though this was a Midwest event, when all was said and done, we had attendees from 7 states: Illinois, Michigan, North Carolina, Louisiana, Maine, Massachusetts and Pennsylvania. There were numerous classmates from the greater Chicago area who could not attend due to previous commitments. 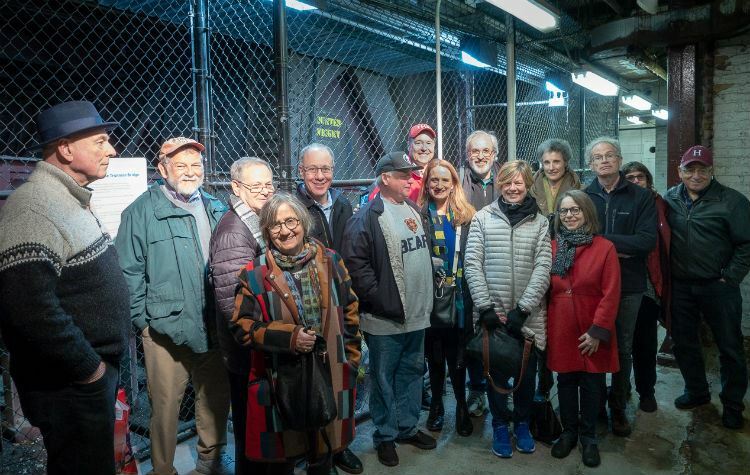 The group met Saturday afternoon at the Bridgehouse Museum operated by the Friends of the Chicago River. Craig Coit, the former chair of their board, arranged to have the museum opened especially for us (it is seasonal) and for Director Josh Coles to lead us on a private tour. Both Josh and Craig told us about how effective the work of the Friends has been cleaning up and beautifying the river. Craig then guided us down the river via water taxi, telling us, in docent fashion, about the river and the architecture surrounding it as we went. Pictured Right: Craig Coit. Image Credit: Rick Weil. We all gathered at the beautiful party room of the Myersons’ building for cocktails and a presentation about ClassACT by Marion and Jonathan. The Myersons were the ultimate gracious hosts, in a setting that gave us views looking north to the Loop and to the east, of Lake Michigan. From there, the late “night crowd” headed to Buddy Guy’s for some blues. Sunday morning, we met up near the University of Chicago for brunch at The Promontory and then headed to the Oriental Institute of the University of Chicago, where Andrea Kirsh gave us insights into the extraordinary collection of ancient artifacts and art from the Middle East. We had a weekend of community and fun. We shared our time, broke bread and advanced the work of ClassACT. 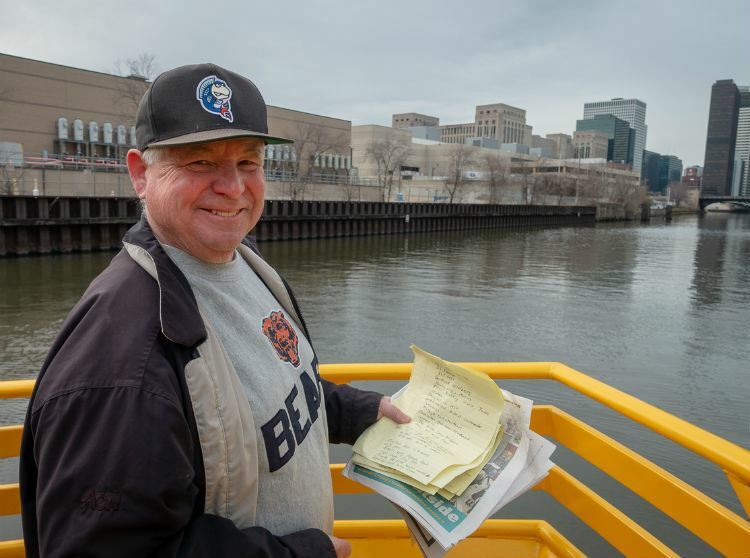 The wonders of Chicago—its recovering river, its artistic resources, and its musical backbone—enriched our time together. JusticeAid’s double feature in Washington, D.C. around the 2018 theme The Criminalization of Poverty: 21st Century Debtors Prison was the best yet. On April 17 classmate Seth Waxman hosted a discussion at WilmerHale, featuring the Executive Directors/ Founders of the two beneficiaries: Alec Karakatsanis of the Civil Rights Corp and Gina Clayton of the Essie Justice Group. The panel highlighted the human and civil rights issues around “human caging” and the 70% of prisoners who are in jail because they don’t have the resources to afford bail; and then the incredible toll on those left behind—primarily women, who have to pick up the pieces to support their families emotionally and financially. The panel was live streamed over Facebook. ClassACT's own assistant Katie Sundstrom was working double time, helping JusticeAid with its social media posts and platforms, as well as overseeing the Facebook Live post of the panel. She’s been nothing short of amazing. Katie also shot more #WhatJusticeMeansToMe videos with all the artists—in the bathroom off the Green Room, our makeshift recording studio. Thank you Katie! 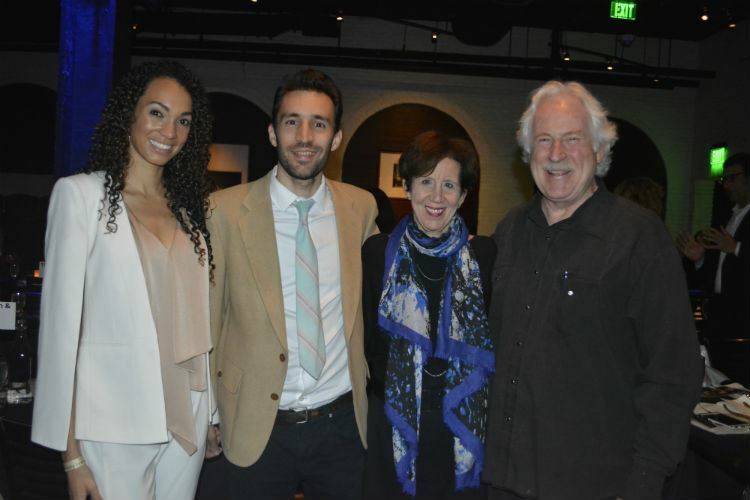 The panel and the concert included short films on JusticeAid's mission and purpose, Civil Rights Corps, and Essie Justice Group. These set the stage for both events, and were great for positioning all initiatives. Don't forget: Reunion Red Book Deadline April 27! Don't forget to send in your Class Report submission for Reunion Red Book. You should have received an email and snail mail about this recently. Although the deadline of April 27 may be a bit soft, timely submission will be important if you do not want to be left out! Also be sure to mark your calendars for Reunion October 11-14, 2018. 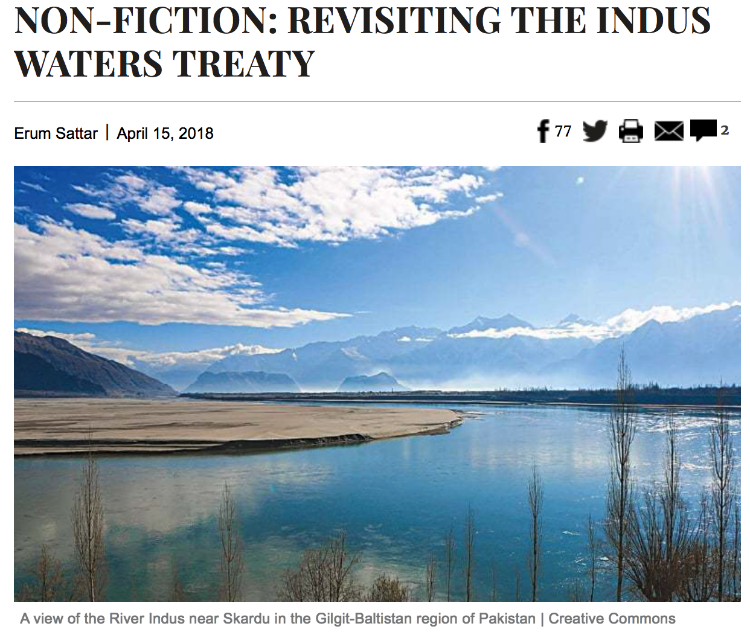 Erum Sattar, BBLP Associate, authored a book review of Indus Waters Treaty: Political and Legal Dimensions by Ijaz Hussain, Oxford University Press. The review was published on Dawn.com; don't miss it!